I’ve been walking a lot, recently, making the most of some free time, and trying to get outdoors as much as possible. last week, my good friend Tracy Homer and I had a long day out in the hills south of Bristol, starting off looking for the source of Pigeonhouse Stream (aka the source of the Malago, but more on that later) and then getting deep into the history of the area, walking through the hills to the megalithic stone circles at Stanton Drew, and back up to Bristol via Maes Knoll, the Iron Age hill fort on the edge of the city. 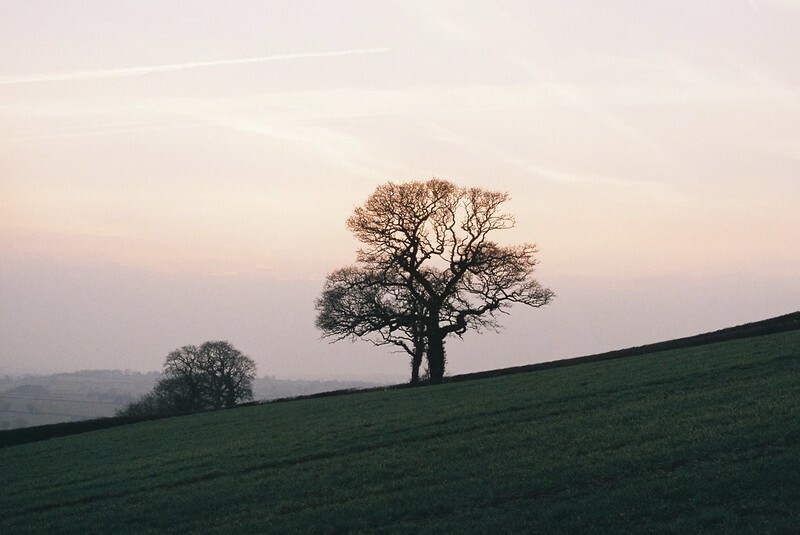 Photos from the walk are here – I managed to break two cameras, with my Canon 550D just stopping working, and stupidly dropping my Olympus XA2 35mm, so they end up being just from my mobile, and my friend Cee‘s Olympus OM10…. If you mouse over or click the first photo, you should bring up the slideshow – otherwise the flickr album is here. We started off with a win, with me getting on the same bus that Tracy was already on, and rode up to Hartcliffe. If you ever do this, you have to do it on the top deck, ideally in the front seat, because the views are fantastic. South Bristol is all hills, and as the bus climbs higher and higher, the Dundry ridge unfolds ahead of you, and it’s a little thrill to think “soon we’ll be up there”. You hop off the bus, walk up a street or two, and at the end of a close, there are the footpaths, and it’s up the slopes into genuine countryside. 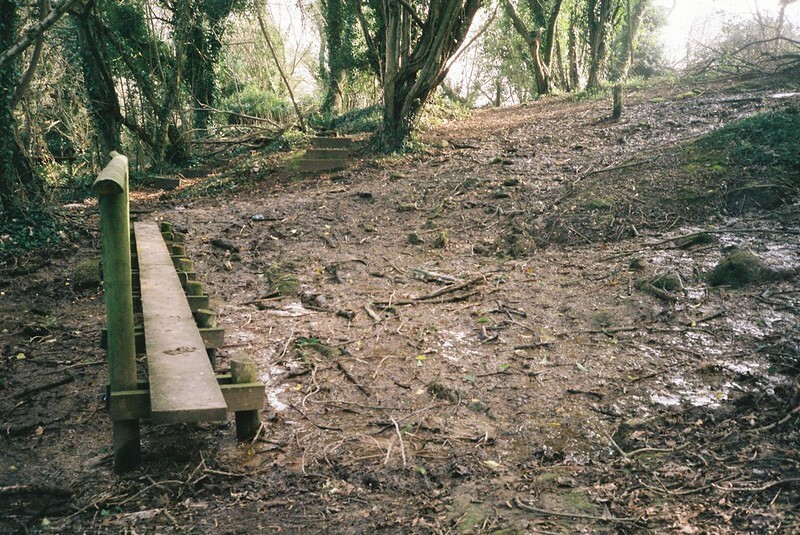 We walked up through Mannings Wood, and one of the first diversions was to check out a strange plank bridge that looked like it was just over mud, but I think was really over a spring. 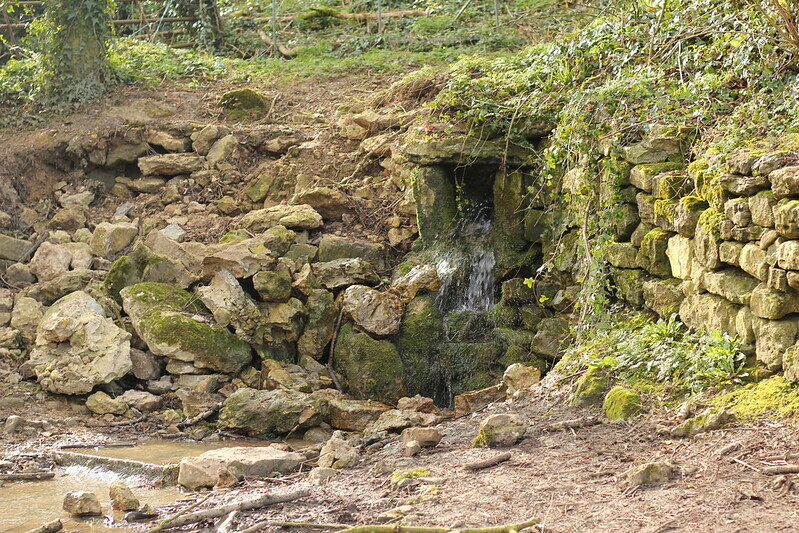 Dundry is peppered with springs and streams on both sides, that start small, and join together, the ones on the north side becoming Colliter’s Brook, the Malago, Pigeonhouse Stream, Brislington Brook, and more, eventually joining the Avon, and then the Severn at the Bristol Channel, and ultimately becoming part of the Atlantic Ocean. 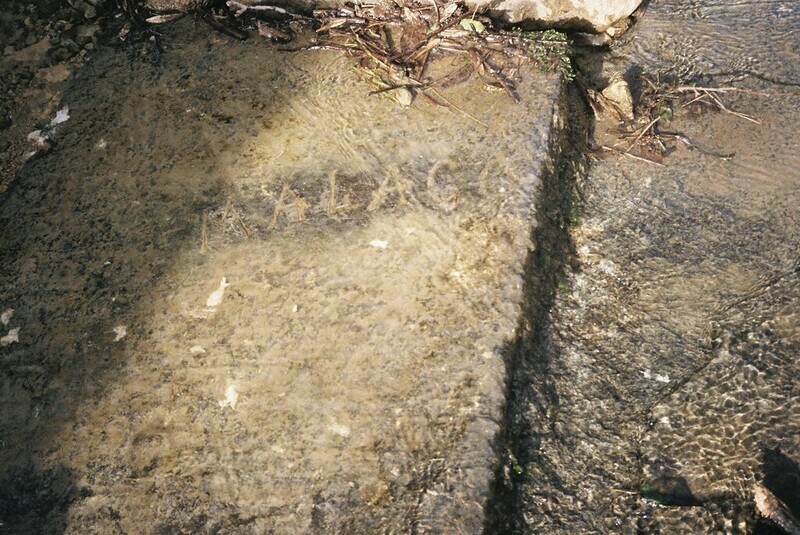 The one wasn’t even a stream yet, just water oozing out of the ground and coming together to flow down the hill, and become the Malago. The wood was full of birdsong as blackbirds gossiped with each other, very gentle trickles of water, and in the background, sirens reminding us how close we were to the city. Sadly the sun went behind clouds and was mostly gone for the rest of the day – we waited and hoped it would come back, and took a ton of photos each. It’s a really lovely place, and I can’t wait to see it in the spring. We headed off, and left the wood. Looking down there was an avenue lined with planting that I’m sure must have been deliberate – clumps of red dogwood in the front, and behind it, pollarded willows with orange stems. We watched a buzzard ride the thermals in lazy circles, watching for prey, and looked ahead to Dundry ridge. There’s an obvious issue with people riding motorbikes in the wood, and when we left it, there were warning signs, and a motorway barrier as a fence along the top of the ridge. We left this and headed down through a field, the footpath unmarked, walking over a soft, ploughed field full of white stones. These stones were in so many of the fields we crossed – harsh soil to grow crops in, and every step pushing them back into the earth. Downhill through the field, then down a lane, and through another field, following the desire line to a deep mud patch around a gate, onto a gorgeous lane. A real holloway, with trees meeting above it, lined with ferns, and a few tufts of fur where some animal crossed under the barbed wire. 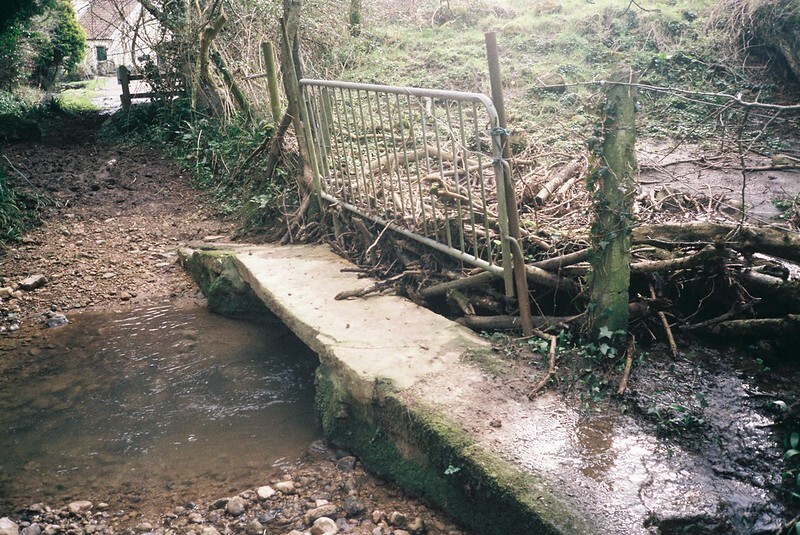 At the bottom there was a narrow concrete bridge that had become a human beaver dam: a metal barrier added to the barbed wire to keep people from wandering up the stream, that drift wood and river debris had piled against. Such a gorgeous little place. On the other side of the river, the road started uphill again, and we passed farm buildings, and banks covered in primroses, a real sign of spring. 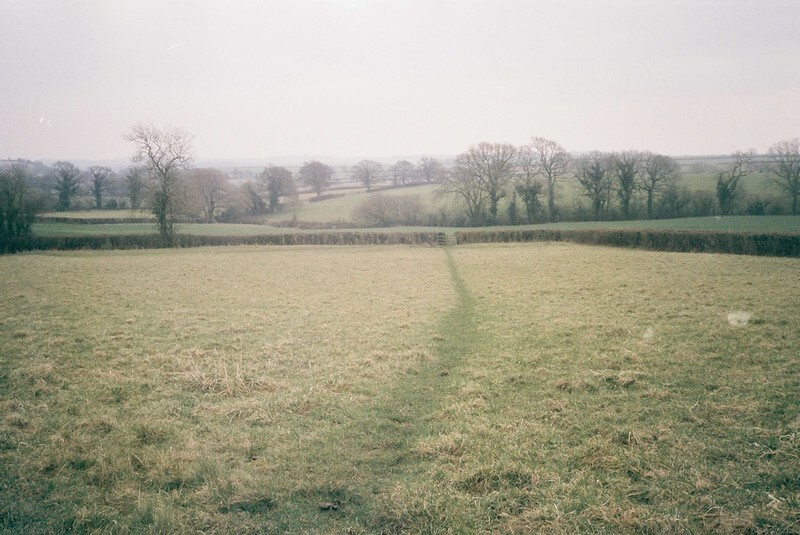 The next section was through fields, where the footpaths looked like desire lines through the winter grass, making me wonder if these would be meadows. 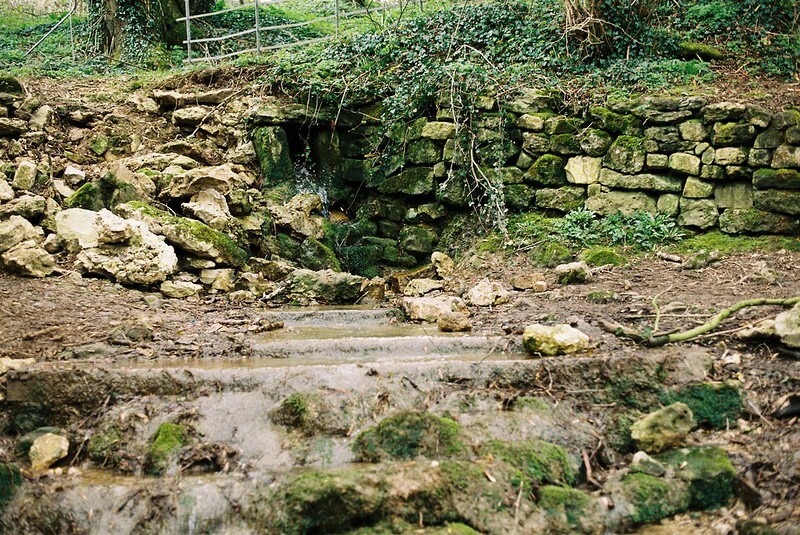 Our paths wound alongside the line of one of the Dundry streams, until we got to Norton Hawkfield, and headed up a hedged-lined road for a while, before coming off into another ploughed field, more white stones and soft earth. This is where my hubris went too far, as I started off thanking Tracy for trusting me to wayfind, and was showing off a little bit about my great sense of direction… and totally missed the path, making us have to walk alllll the way around a weird-shaped field rather than across in a smooth straight line. We debated pushing through a spiky hedge, but walked all the way round instead, me kicking myself. Down through more fields, with the sound of the radio carried up to us from road works by the Round House, the tiny former toll-house… and this is where I dropped my Olympus XA2, and broke it forever. Damnit. I am so unhappy about this, a week later! Anyway, I’ve been to the Stanton Drew Stone Circle a few times, but had never realised how close it is to Bristol. 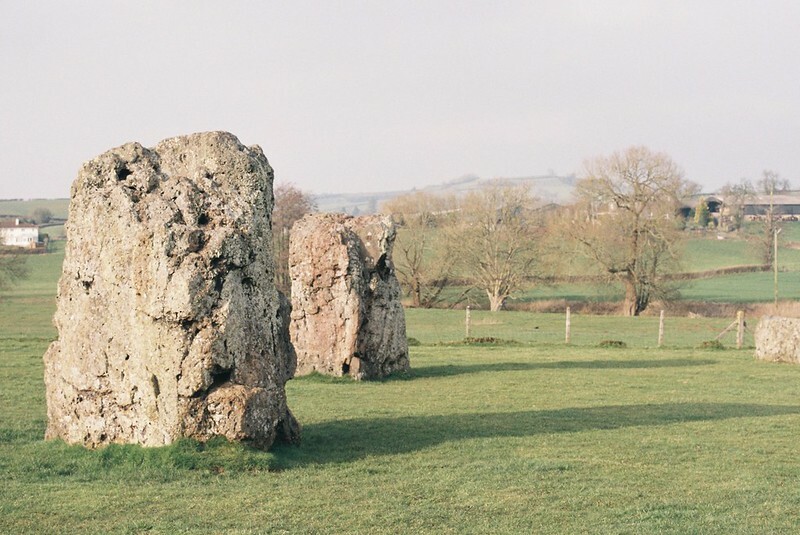 If you haven’t been, there are three stones in the garden of the Druid’s Arms pub, the second largest stone circle in the UK and a small circle in a field, with a third circle of fallen stones in a smaller field. 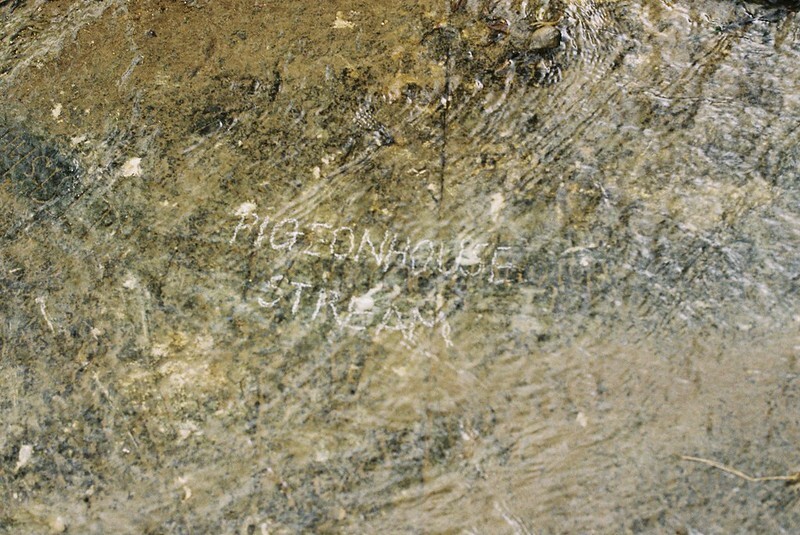 There’s evidence of underground chambers and more archeology, and it’s a fascinating place. It’s not as dramatic as Stonehenge, or Keswick, or Avebury, but it’s gorgeous – and now I know it’s Maes Knoll in the distance, it’s pretty staggering how close it is to the city. At this point we went off-map. I had forgotten my 1:50000 map, and so we were guessing where to go, and took the wrong footpath back, adding 3.5km onto the walk. Basically I was a terrible walk leader! It was beautiful, but still, stupid. Back to Norton Hawkfield, and then across to Norton Malreward, along a path with benches to still and enjoy the view. Apparently this bowl of valley is often hazy, and it definitely was today. As we got to the bottom of Maes Knoll, the fading sun was showing through the haze, which was very pretty, but meant we had to push on so we didn’t loose the light. Coming up from the south, Maes Knoll isn’t especially dramatic, rising up in ripples of land, until we got to the flat top, the former Iron Age encampment. Once at the top you can see the defensive side where it falls sharply, with corrugations, and a ditch and bank at the bottom, and then, on the northern edge, a tall wall of earth, showing us exactly which way the enemies would come from. It’s extraordinary, and I really need to go back and take proper photos, though I don’t know how I will, because it might just be one of those places you need to experience in real life. Despite mistakes, breaking a camera, losing the light, that was an amazing walk. Probably not a February walk, because I hadn’t factored the extra time to take photos, but wow, so many fantastic places, so close to the city. 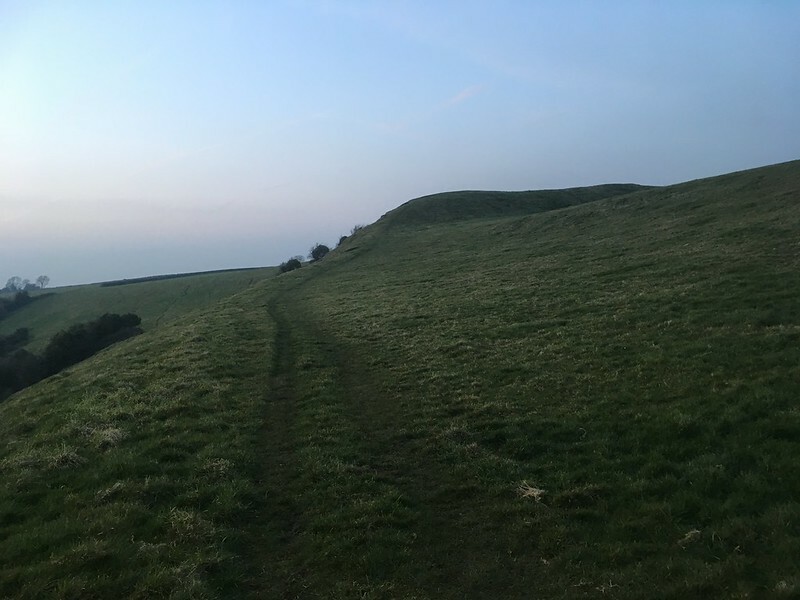 I came back and spent the evening mapping more walks around Dundry, because spring is coming, and there’s so much more to discover.